A commonly accepted rule of thumb is that you should not date anyone who is less than half your age, plus seven years. For example, an 18-year-old should not date someone who is younger than 16, since half of 18 years is nine years, plus seven years yields 16 years. Similarly, a 40-year-old should not date someone younger than 27. (This rule applies to men as well as women.) The resulting range of acceptable age combinations is shown in the chart above. As always, many thanks to Randy Olson for sharing his work with Know More. 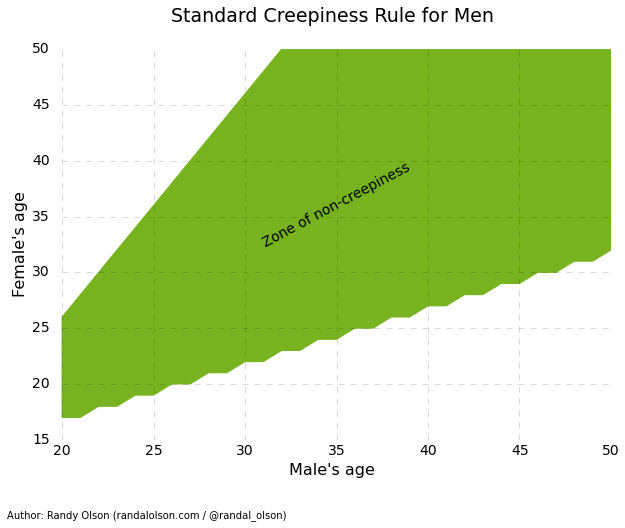 Know more: Do men on OKCupid follow the Standard Creepiness Rule?